To a novice, Oxfordian architecture seems largely based on sandcastle design. It appears to have no substance or foundation, vulnerable to being washed flat by the next tide. Yet there are a few Oxfordian institutions which endure. We're going to have a look at them. First up is politicworm, for a long time the largest of the Oxfordian blogs. Run by Stephanie Hopkins Hughes, the site is a shining example of contrarian methodology. Education is a big deal for Oxfordians. We're going to look at her detailed account of Oxford's studies. Politicworm's contribution turns out like Black Adder's pencil. In 2004, Stephanie Hopkins Hughes, sponsored by an Oxfordian fellowship, travelled a very long way to sit in an English library and stare at manuscripts she couldn’t read. In the Old Library at Queens’ College Cambridge I was trusted for several hours with two of Smith’s personal notebooks, both containing material relating to the period that de Vere was with him, but apart from the room in his home at Ankerwycke labelled “My Lord’s chambre,” there was nothing that obviously related to Oxford (these notebooks could certainly bear a close examination by someone better qualified to interpret the scribbles of the Secretary Hand than myself). There in a nutshell is the grand Oxfordian endeavour. In Hughes’s historical fantasy, de Vere came to Sir Thomas Smith at Ankerwycke in Bucks in 1554, and the child and the humanist lived in an Edenic scholarly retreat, all in all to each other and essentially alone (a ghostly servant here and there walks on). In reality, Smith abandoned Ankerwycke—save for custodial visits—in 1554, having acquired a much grander house in Essex. It was to Hill Hall that the viscount would have come, by all evidence no earlier than 1559. Had Hughes been truly able to read—not only to decipher but interpret—Smith’s manuscripts, she might have learned a great deal about his long-forsaken house at Ankerwycke in 1561: that “my L. Chamber” lay in the servants’ quarters, and was furnished as plainly as a potboy’s; that Smith (it seems) no longer kept a room there for himself, his old one being used as a linen closet and a lumber room; that in twenty rooms there was no study, and exactly one book: a bible. Smith’s life was in Essex, with everything he valued: his magnificent library, his artworks, his experiments in distillation, his “Prospect of the Skies.” So what was the viscount doing in Bucks? One does wonder. Anyone who likes may read Smith's notebooks now: partly at Oxfraud's request, Queens' College, Cambridge, working in conjunction with Scriptorium: Medieval and Early Modern Manuscripts Online, has granted open access to these documents: Queens' College, MS. 49 and Queens' College, MS 83. Hughes is the archetypal Oxfordian. “Research” to her means finding scraps of information she can bricolage, ignoring what cannot be made to prop what she imagines. She can create an orchard on a desert island out of one or two picked cherries and a vast denial of reality. I cannot begin to deconstruct her alternate cosmology—it is too vast—but I’d like to look at how she handles one brief period, the viscount’s bringing up in Smith’s household. For one thing, it gave me the pleasure of acquaintanceship with Smith. A prickly, complex, brilliant man—of great attainments, yet of lower birth than William Shakespeare—he deserves a truer history. But perhaps her greatest revelation is that de Vere, and de Vere only, had the early education requisite to shape a genius—that he alone had Shakespeare’s childhood. First to publish the fact that Oxford was raised by England’s foremost scholar of Greek and Civil Law, Sir Thomas Smith, that he lived with Smith and his wife from age four to twelve, that most of those years were spent at Ankerwycke near Windsor. 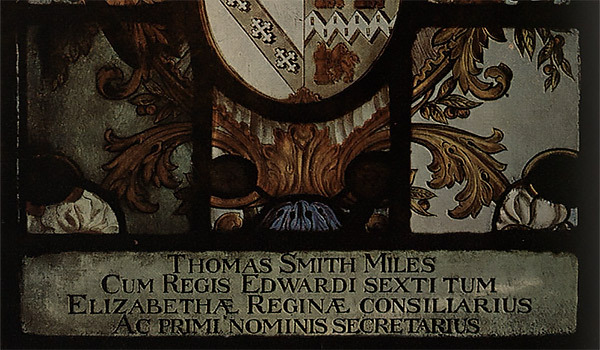 Why is it so important to know exactly when de Vere came to live with Sir Thomas Smith? Sometimes a single fact can become the key to an entire period in history, with an inverted pyramid of evidence demanding a single fact to connect it to the rest of what we can take for granted. Current discussion over when Oxford came to Sir Thomas Smith makes it clear that this is that sort of key, that at least one solid fact is required, not just to complete our picture of Oxford’s life, but much more, completing our picture of Oxford as Shakespeare, and beyond that, of Shakespeare as central to the history of England at what may be seen as the most crucial period in her history. Yet she’s made many unfounded assumptions: that Viscount Bolbec came to Ankerwycke in 1554; that the place was beloved by him, and his time there formative; that Smith was his sole teacher and companion, indeed his “surrogate father”; that de Vere was remarkably brilliant; that he would be—not only Shakespeare but a sort of hyper-Shakespeare, the Elizabethan singularity; and that her first assumption, taken as a truth, must lead directly to that last, which therefore proves her first. What all that high-piled cumulus means is that she’s betting the farm on Ankerwycke. It’s a fine example of Oxfordian methodology. They’re great believers in the magic Key to All Mythologies. For Hughes, the key is her belief that that Edward was at Ankerwycke in his prodigious infancy—where else could he be learning Greek at four? Where else in Tudor England were there birds and flowers? Evidently, Hughes got this idea from Mary Dewar’s 1964 biography, Sir Thomas Smith: A Tudor Intellectual in Office. When John Taylor, Bishop of Lincoln, specially aroused Mary’s wrath and was evicted from his bishopric in March of 1554, Smith offered him a home at Ankerwicke where he died in December. At the same time Edward de Vere, only son of the Earl of Oxford, Mary’s Great Chamberlain, was placed in Smith’s household (Dewar, 77). As for the date, December 1554, although the letter she cites fails to support it, she is specific enough that we may consider it partial, if not definitive, evidence, perhaps based on information in a letter or other document that she failed to note at the time for later citation. More probably Dewar just screwed up. As Hughes should have noticed, Dewar can be shockingly sloppy. Just three pages later, she writes: “In October  Smith was appointed to assist the Earl of Oxford in receiving the Duke of Friesland [sic] who had come to offer the hand of his brother Eric of Sweden to Elizabeth.” This of course would have been John, the 16th Earl, then aged 43, who met with John, Duke of Finland. Yet Dewar writes that Smith “took the opportunity to praise the way in which the young Earl was entertaining the Duke and said that no one could have done it better.” Young Earl? Does she mean Edward, then aged nine? She does. “This was probably a source of satisfaction to both of them; for after leaving Smith’s household at the age of twelve the young Earl had become Cecil’s ward” (Dewar, 80). And she cites “Smith to Cecil, 1 Oct. 1559. 12/7/2.” This is mortifyingly bad scholarship: not only does she confuse the father and son, but writes as if Edward’s future were past, as if 1559 had happened after 1562. Did the boy have a Tardis? At Christmas 1554, as Hughes imagines it, the little viscount—the white hope of the English Renaissance—was smuggled by a conspiracy of Protestants “over the snowbound roads ... perhaps by sleigh” into hiding at Ankerwycke. Whatever Cecil’s arrangement with Smith, it would have been by handshake, nothing on paper, all communications by word of mouth, either by courier or more likely, face to face. The less anyone knew of the whereabouts of the heir to the Oxford earldom the better. As soon as the holidays were over the burnings began. Her blue-eyed boy, she thinks, was being hunted by the Catholic reign of terror. This is nonsense. Edward’s father took part in the burnings. You may read of him in Actes and Monuments (Foxe, Book 11, 1797, 1816-7, 2138, 2135; Book 12, 2197, 2238, 2327). In 1554, Sir Thomas Smith and John de Vere, then Earl of Oxford, belonged to opposing parties. Both were in Essex: Smith, unmolested; Oxford, unpleasantly busy. Oxford had defected to Mary’s camp, which got him his great chamberlainship back; he secured Ipswich for her—put down the Protestant resistance—and in 1555 “was instructed to assist with the burning of heretics at Colchester and Manningtree, which apparently he did” (J. Hughes). He did—and much more. Of the Essex men and women brought before the Earl of Oxford to be charged by him with heresy, and thence conveyed to London for examination, at least sixteen were burnt: four in 1555, seven in 1556, and five in 1557. This would not have endeared him to “the protestant leadership” of Hughes’s narrative. He had joined the inquisition. 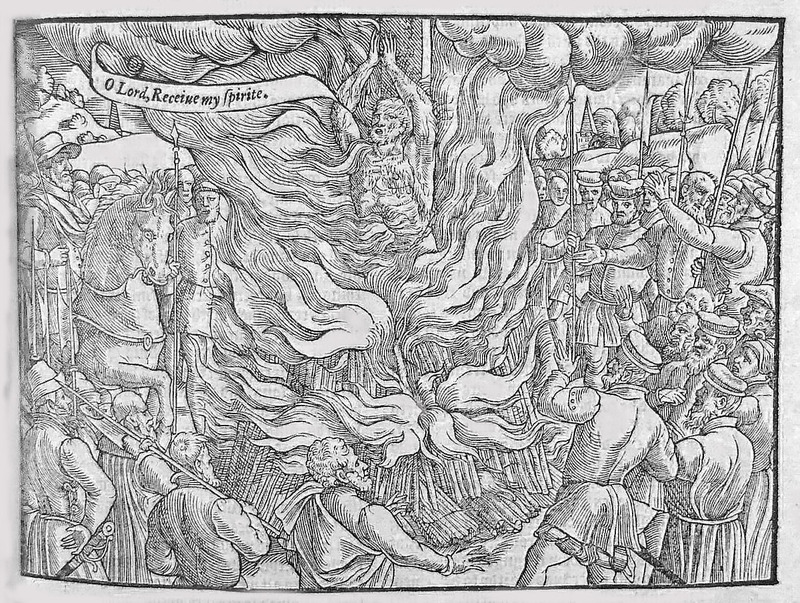 The woodcut is of Thomas Hawkes, a gentleman, the earl’s late servant, burned at Coggeshall on 10 June 1555. The earl did not himself condemn his man, but “wylling to cleare hys own handes”— like Pontius Pilate— passed him on to “the Bloody Bishop” William Bonner. Oxford wrote: “I haue sent you one Thomas haukes, dwelling in the Countie of Essex, who hath a child that hath remained vnchristined more thē three weekes, who beyng vppon the same examined, hath denyed to haue it Baptised, as it is now vsed in the Church: wherupon I haue sent him to your good Lordship to vse as ye thinke best” (Foxe, Book 11, 1797). Hawkes had been “loued of all the houshold, so long as Edward the sixt lyued.” Had he borne the viscount on his back? Is this how Edward learned that servants are disposable? Even Oxford’s company of players seemed to be incendiary. They had appeared only twice during Edward’s reign. But between 1556 and 1558, they toured widely—Norwich, Oxford, Bristol, Canterbury, Dover—and in nearly every town, their coming coincided with martyrdoms. There was, writes Mary A. Blackstone, a “striking coincidence of player appearances and executions” (Blackstone, 200). Were their devices propaganda? Yet for all this apparent zeal—Vere even peached on members of his household—his Queen did not trust him. Who trusts a turncoat? “Mary viewed Vere’s enthusiasm for Catholicism with suspicion. His name topped the list of noblemen suspected of complicity in 1556 anti-Catholic conspiracy” (Blackstone, 200). His faith, it seems, was an expedient, cynically deployed. The deaths were real. And Smith was still an outright Protestant. He could not, while Mary reigned, have fostered Oxford’s son. Could he, in all good conscience, raise the viscount as a Papist? In defiance of the earl, in safety, as a Anglican? No. For his part, Vere would not have chosen Smith. As a tactical Catholic and suspected shuffler, he could not have openly engaged a heretic. (A Jesuit as tutor might have been the shrewdest choice.) Stripped of his offices, politically eclipsed, Smith was tolerated, even pensioned by the Queen. But linked with John de Vere? That could destabilize them both. Who knew when the Queen would die? In 1554, the widowed Smith remarried, and so got an manor in his native Essex. That new estate was Smith’s great project, one of his serial obsessions. He himself designed a new Hill Hall on Vitruvian principles, and was much absorbed in perfecting it. He would entirely rebuild it twice: it was still a work in progress when he died. For the scholar—Essex born and bred—this would be a coming home. It was in Essex that he kept his library “of a thousand Books, of various Learning and Arts (Strype, 219); in Essex that he built his still-room for experiments, with a servant to attend it (Dewar, 142-3). Just how much time do you imagine he’d be spending at Ankerwycke, once he’d acquired his beloved Theydon Mount? All the sources agree: not much. In 1550 he acquired ... Ankerwyke near Eton, and this became his principal home during the rest of Edward’s reign as he busied himself about college affairs. ... By this [his second] match [in 1554] he acquired the extensive manor of Theydon Mount in Essex with its two houses, Hill Hall and Mounthall, and these became his principal residences in the years ahead (Archer, ODNB). She brought with her the Essex manor of Theydon Mount, a substantial property which Smith promptly made his main home (Dewar 77). With this, his second marriage , he quit his new house at Ankerwyke and moved into the one that was part of Philippa’s jointure, Hill Hall in Theydon Mount. In 1557, he began to rebuild this house (RootsWeb). In 1557, the year of his old father’s death, Sir Thomas, being the husband of the widowed Dame Hampden of Theydon Mount, began to rebuild the Hampdens’ house of Hill Hall, deserting that house at Ankerwycke which he had made to be near his Eton provostship” (Country Life 26). This marriage led to Sir Thomas Smith’s quitting his new house at Ankerwycke as his customary residence, and to his erecting another in his native county (Nichols 109). 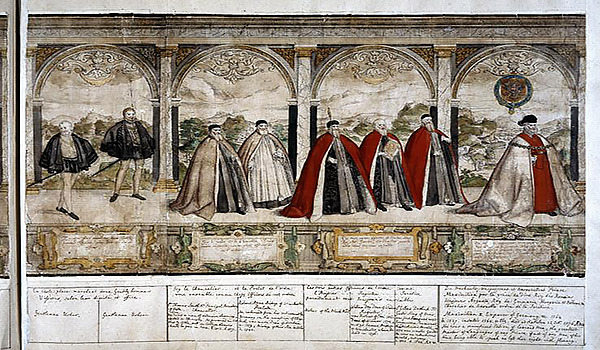 In his magnificent folio study, Hill Hall: A Singular House Devised by a Tudor Intellectual, Paul Drury recapitulates: “Sir Thomas Smith was forty-two years old when, in 1554, he married Lady Philippa Hampden, and so came into possession of the Hill Hall estate, which was to be his principal residence for the remaining twenty-three years of his life” (Drury, 248). He would make of it an idiosyncratic masterpiece, would in its last transformation, after 1567, “recreate in Essex the neoclassical Renaissance splendour of the French court … a centre for culture and learning” (Hadfield, 167). Work began at once. Alterations to the existing house—a new kitchen wing, a courtyard—can be dated to 1554-6 (Drury, 41). Then, once Smith had acquired the reversion of the estate in 1556, he embarked on his first complete rebuilding: “1557º Montaulam aedificavi. ... 1558º Aedificavi ad huc montis aulam” (Nichols, 118). You ask: but wouldn’t Smith have gone crazy at Hill Hall, while all that hammering was going on? Why wouldn’t he have stayed in Ankerwycke where it was quiet? He didn’t have to. According to Strype, “he kept four Houses furnished, two in the City, (besides his Lodgings at Whitehal) and two in the Country” (228). Besides his estate at Theydon Mount (where he lived in Hill Hall, or Montaula, or Monthall, and lodged servants in a lesser farmhouse, confusingly also called Mount Hall)2, he kept “Ankerwick, (his Country Retirement in King Edward’s Reign).” In London, he had “another House in Philpot-lane,” which he shared with his brother George, and yet “another House in Fleet-Lane. … And here he would sometimes be, as a Recesse from Court” (Strype 226; Archer). There was also “a large town house in Saffron Walden, almost next door to one … owned by the [Gabriel] Harvey family” (Hadfield, 168). Smith never sold Ankerwycke. His lands there were a source of income; but harvests were poor and his bailiff dishonest (Dewar, 141-2). He would need to visit there from time to time to sort things out. If the Queen had been often at Windsor, it might have served as a useful pied-à-terre—but the Queen was most often at Whitehall, and if needed, he kept lodgings there. But after 1554, he was Smith of Hill Hall. Ankerwycke was a bygone. Why? Two reasons, at least, seem to underlie the change. First, Smith had lost the provostship of Eton, and so no longer needed to spend extensive periods in its vicinity; and second, having always suffered from poor health, he considered the hilltop at Theydon Mount much healthier than the low-lying Ankerwycke (Drury, 260). In Queen Elizabeth’s reign he frequented not this House so much; then delighting more in Mounthal, standing high, as Ankerwick was low and waterish; which I suppose he therefore avoided, thinking it not so wholesome for him, being very subject to cold Rheums” (170-1). In a letter to Thomas Heneage, Smith writes of Ankerwycke and its discomforts, in a very English vein of comic misery (HMC 12). When I was at Ankerwick I was doble besegid ; without with water, that no man might com to my howse for water, nor we to no bodie but by bote, and that a good long jorney ; within I was besegid with a catarre and an agew that kept me in my bed and chamber all the while I was there, that never left me till it made me past goeng and ridyng, and that in six dais. ... I suppose it hath done me good, and skowred away the reliques of this contagious somer and harveste, encombraunces of lamenes and other imbecillities come unto me by the evill disposition of the aier ; and yet an other way I may dowte, for a cloth the more it is washed the more it is worne. He makes Buckinghamshire sound like an exile in Babylon: “by the waters of Ankerwycke…” This, by the way, is better writing than any of Oxford’s: Smith evokes a wet week in the country far more vividly than his pupil could a year in Renaissance Italy: “for my lekinge of Italy, my lord I am glad I haue sene it, and I care not euer to [se] see it any more.” The sentiments are much the same. Yet in 1565, it was to Ankerwycke—”my poor house at Ankerwick”—3and not Hill Hall that the Queen came on her summer progress. There was no one home. She knew Smith was in France: she’d sent him there. Displeased with his ill manage of his embassy, deaf to his pleading for an audience at home, she devised the most exquisite snub, descending in full panoply on his second-best house4 to grace his absence with her Presence (Cole, 82-3). So where does the viscount come into all of this? And when? Hardly at four, for good reasons on both parts. Children usually were sent away to learn at about seven: old enough to profit by their teaching, whether of a trade or grammar; old enough to serve. At seven or eight, the boy would have come with his tutor, not a nurse: prepared to work. By then, both the earl and the scholar-statesman served one Queen, in one Church. And here I can see a humanist directive in the viscount’s tutelage. He'd been nursed in the household of a Quisling—a violent, dissolute, and unprincipled father—amid a rabble of unruly henchmen. Smith’s job would be to civilize the young barbarian, beginning early in Elizabeth’s reign. Under Marian rule, the earl's son would not have gone to the household of an Edwardian; nor had Smith the time or space for such an undertaking in those years. Think about it: in 1554, Smith was newly widowed; he was housing a reverend and beloved old teacher, quite possibly dying all that year (Bishop Taylor had spent the last winter in the Tower, which was scarcely a spa); that July, Smith lost his provostship at Eton and gained a new wife, a widow with a manor in his native Essex. And he’d fallen in love—with Theydon Mount. Do you imagine that the newlyweds would want to add a child in petticoats, his nurse, toys, and tantrums to the mix? And where would Smith have housed that child? An heir to an earldom, an only son, for whose life and health he was responsible? Smith well remembered his own delicate and sickly childhood. Six days at Ankerwycke, and he was a dishrag. No, not there: it was unhealthy. Hill Hall was at sixes and sevens. Not there. Until after 1558, when the first rebuilding of Hill Hall was completed, he could offer a prospective pupil only a choice between a malarial swamp and a building site. In 1559, newly in the graces of a new Queen, and with a splendid new humanist house, he could foster an earl’s son in proper style. An arrival at Theydon Mount in 1559 meshes neatly with the viscount’s timeline. At eight years old, roughly the age at which less privileged boys began grammar school—the age of the younger boys at Eton—he acquired a tutor. From 4 May 1558, Thomas Fowle received £10 per annum ”for his services in teaching Edward de Vere his [Earl John’s] son Viscount Bulbecke.”5 There wouldn’t be much point in hiring Fowle if (as Hughes imagines) Edward were already Smith’s protégé. But Hughes thinks that the prophetic Smith, foreseeing Mary Tudor’s death later that year, and “certain that he’d be picked for Elizabeth’s Privy Council,” put his charge in other, lesser hands, and stood ready to be called to govern. In October 1558, Lord Bolbec entered Queens’ College in Cambridge; on 14 November, three days before Mary’s death, he matriculated. He was eight years old. His youth was not remarkable. After the dissolution of the monasteries, gentry “who had been accustomed to look to the households of abbots and priors to train up their sons but were now seeking an alternative … lighted on colleges with rooms for hire” (Simon, 245). These boys were “sometimes sent very young with their own tutor as they had formerly been dispatched to monastic houses” (Simon, 249). Fowle would have accompanied the viscount as his tutor. By the new statutes of 1549, “all grammar teaching was excluded at the universities” (Simon, 252). Since all of the coursework was conducted in Latin, there would have been nothing that the boy could do towards a degree. It seems he was bored, or rebellious. After the infamous bills in January and March 1559 for the repair of window-glass, his name disappears from the books. It makes sense that, having failed to settle down at Cambridge, he should have been moved into a less distracting environment. Edward would, most probably, have brought his tutor to Hill Hall: Fowle continued to be paid. Smith would have overseen the boy’s curriculum and examined his progress; he might, I think, have lectured on the duties of nobility, and conversed in Latin or in French at meals: but the drudgery of birching hic haec hoc into the boy would have been left to an underling. Did the viscount ever stay at Ankerwycke? He could have. Smith appears to have made occasional visits (and complained about them): maybe he brought de Vere, maybe he left him in Essex with his tutor, to get on with their work. Essex, after all, would be the next Earl’s seat of power. Perhaps Smith’s Essex roots and his Essex manor had been factors in his choice as viscount-minder. Certainly, Oxford’s written language—he spelled as he spoke— suggests an upbringing in East Anglia, not Buckinghamshire. If he imbibed the wisdom of its countryfolk, as Hughes imagines, he must have done it in dumb show. What of Hughes’s ace? Her great discovery of “my L. chamber” at Ankerwycke? Queens’ College, Cambridge does indeed hold two of Smith’s manuscript notebooks, including inventories of his goods: “ffownde at Anckerwick vj°. Novembris 1561” (ms. 49, ff. 80r-86r) and “ffounde at Ankerwick 27°. Septembris 1569, and committed to the custodie of Thomas Hurste” [the farm bailiff] (ms. 83, ff. 121r-124r). I have read them. Though she travelled to Cambridge expressly to look them over, Hughes has not, admitting that “these notebooks could certainly bear a close examination by someone better qualified to interpret the scribbles of the Secretary Hand than myself.” The field is wide open. What strikes me is the relative plainness of the goods. At Hill Hall, in its last glorious transformation, Smith “covered every possible space with a series of magnificent wall paintings and tapestries, as well as commisioning an expensive collection of stained glass and floor tiles, all designed to narrate a series of important moral stories. … These ambitious sequences … would have had a considerable impact on Spenser, the most visual of all Elizabethan poets” (Hadfield, Spenser, 90). 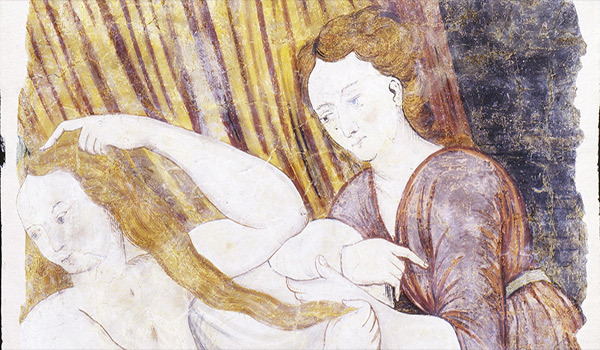 At Ankerwycke, there was nothing more artistic than his late father’s tapestry of Sampson and Susanna, and “my picture in a table.” It might be the farmhouse of a wealthy yeoman. No wonder Smith was mortified to have the Queen look round it. All this household stuff is fusty. And the furnishings are changeless: item for item, what’s there in 1569 was there in 1561, and probably in 1554. Some of the bedding is monogrammed ES (his first wife’s initials) or IS (his father’s) and marked with the date: 1549 mostly, but a few things even earlier. Nothing is dated after 1552, the year before Elizabeth, his Lady, died. Hill Hall was a work in progress; Ankerwycke, an archive, frozen in time. Did Smith take nothing with him to Essex? Or did he abandon the house, contents and all, as relics of a former life? There’s no bed—no furniture at all—“in myne owne Chamber,” nothing but “the strangers chist” full of linens. He must have slept somewhere on his visits—perhaps “the greate gest chamber” held the bed he kept to, snuffling and shivering, that autumn of the flood—but this was no longer his home. Nor is there a bed at Ankerwycke for Philippa, the new Lady Smith. “In my wiefe’s Closet”—that should have been her private room—there’s a table and more white goods. There may be a history here: “In the black coffer … ffirst, a bearing cloth for a Child.” Beside that in the 1561 list, Smith notes “SS.” The initials belong to neither of his wives, nor to his parents, nor his illegitmate son. A baby that died? A mystery. Less of a mystery is “the Chamberlains chamber,” still handsomely furnished in 1561, but with the valuable bed-hangings bundled away “in my fathers chist in my chamber” (ms. 49, f. 81v). That room would have been prepared for William Parr, the marquess of Northampton, who was Lord Great Chamberlain from 1550 to 15536: exactly the years when Sir Thomas lived at Ankerwycke. Smith and Northampton were closely involved at that time. Sir Thomas had bought a manor in Somerset from the marquess in 1547 “on terms so favourable as to suggest a link between the purchase and Smith's membership of the commission to investigate the marquess’s divorce” (Archer). That body ruled in Northampton’s favor. In March 1551, a private bill of divorcement was passed in parliament, and the marquess’s remarriage legalized; in May of that year, Smith was sent with Northampton on an embassy to France to conclude a marriage treaty between Edward VI and Princess Elisabeth of France. Perhaps his lordship stayed at Ankerwycke beforehand, to confer—but stay he did. Nearly twenty years later, the room still bore his title. The marquess would have been a congenial guest, as “an enthusiastic scholar and Francophile” who “maintained a long relationship with Cambridge University” (James). Are we to suppose that Smith, like his sheep-farming yeoman father, was illiterate? If this were the inventory pinned to Stratford Shakespeare’s will, Hughes’s gang would be all over it, jeering and exulting. Smith’s books, of course, were elsewhere. 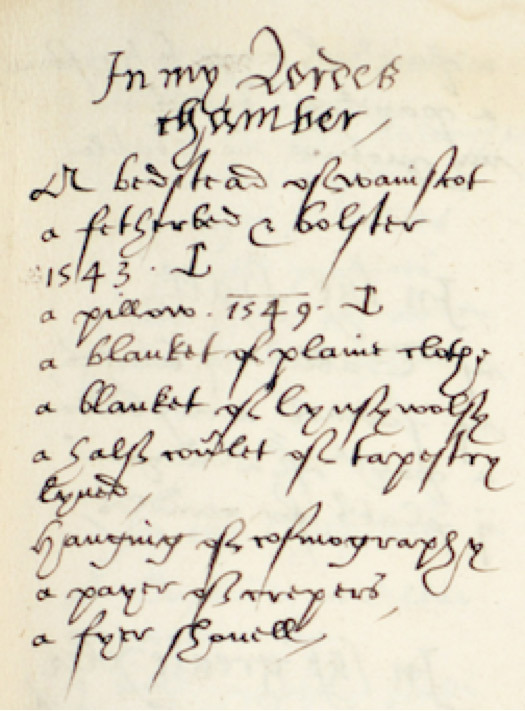 In that same Queens’ College manuscript in which the inventory of Ankerwycke is written, Smith made a catalog, dated 1 August 1566, of the “Bookes fownd in my galerie at hill hall & set eche in his order” (ms. 49, ff. 70r-78r). At Ankerwycke in 1561 and 1569: no books. At Hill Hall in 1566: a magnificent library. Where do you imagine Smith spent his time? But Hughes hasn’t noticed the absence of books. She’s seized on four words: “In my Lorde’s Chambre.” “By ‘My Lorde’ Smith must mean de Vere.” “Must”? There were other Lords in Smith’s circle. Why not my Lord Bishop Taylor, who died in that house? After all, the lists still name “my fathers chamber,” “my wiefs closet” (if he meant Elizabeth): both dead in the 1550s. That sort of memory haunts a place. But look: no honored guest slept here, in this bare chamber, sandwiched in among the servants’ rooms. © Queens' College, Cambridge and Scriptorium: Medieval and Early Modern Manuscripts Online, Faculty of English, University of Cambridge. Take a look at the furnishings in 1561: “a bedsteede of wainscot, a fether bed & bolster, a pillow,” “a half coverlet of tapisstrie lynd,” and two blankets of “plaine cloth” and “Lynsy woolsey.” Don’t think of tapestry as rich adornment. Even in the other servants’ chambers there are “blankets of tapisstrie” (perhaps an old arras was cut up? ), and the “maydes Chamber,” much finer than the viscount’s, boasts “a tester of grene silke” and “hangings of grene saie wt a border.” His could be the garret of a footpage, but for “a hanging of cosmography”—and that, ironically appears only in the 1569 inventory, long after his lordship’s departure. The other modest additions to the room are fire-irons: “a payer of crepers”—small iron fire-dogs—and “a fyer shouell.” Here the linen-marks are recorded: 1543 IS and 1549 IS, matching those in Smith’s father’s room, though the late yeoman’s comfort was enhanced with a “frynged” tester, “curtaines of blew sarsanet,” and a “quilt of blew damaske.” Those pale beside the boy's inheritance to come, the hangings "powdered with blewe borys" (Nelson, 20); but here and now, his walls are bare. This would have been the viscount’s room when he visited Ankerwycke. Its austerity is as it should be: “The heire as long as he is a childe, differeth nothing from a servant, thogh he be Lord of all.” (Galatians 4:1). I wonder if Oxford resented Smith as much he did Cecil? Hughes wants "my L. Chamber” to prove that Oxford spent his infancy at Ankerwycke, in Wordsworthian bliss, from 1554 to 1558, and Christmases thereafter. Narrowly, it puts him there only for an unspecified period in or before 1561, and he came down from Cambridge no earlier than 1559. Given Smith’s disfavour of the place, its dank and dreary booklessness, his own visits must not have been for long: a week or two when necessary. He kept no room of his own at Ankerwycke; yet “my L.” had a chamber to himself there. Could it be that Smith went away and left the viscount moldering there, like Mariana in the moated grange? 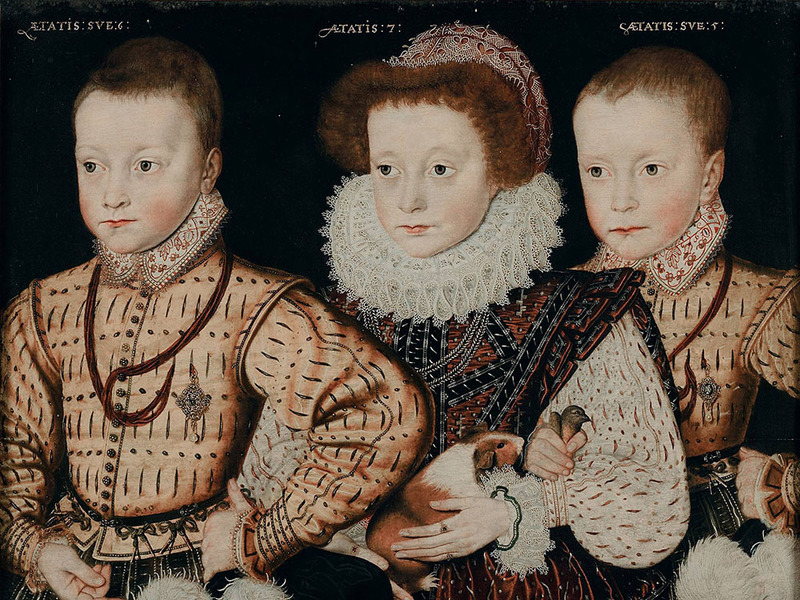 It would be discipline—and for Elizabethans, childhood was ideally boot camp. “The point was toughness, an ability to cope with a difficult, often hostile world” (Dewald, 174). Perhaps the boy was sent down there for intensive work with his tutor, Fowle, away from the distractions of Hill Hall? Conjecture, yes—but unlike Hughes’s flights, founded on a reading of the “scribbles.” Really, that inventory dated 1561 is something of a liability. If only the 1569 version existed, you might argue that the house had been stripped of its amenities when Bolbec departed—but there he is in 1561, with half a coverlet, no books—and quite possibly no Smith. De Vere was still with Smith when the first list was written, and although the family had moved to Hill Hall by 1561, the winter holidays may have been spent at Windsor Castle that year. Ankerwycke would also have been closer to Hampton Court, where some Royal holidays took place. As a matter of cold fact, all of the court Christmases and Shrovetides from 1558 to 1562 were held at Whitehall (Streitberger, 239-43). Smith had lodgings there, if he had wanted to frolic. But he took no pleasure in revelry. “Smith was never at ease in the courtly milieu. He readily confessed that his bluntness made him few friends; he lacked interest in the courtly arts of dancing and music; and he never shared in the adulation of the queen” (Archer, ODNB). Hughes could have looked this up herself in five minutes—but why let facts spoil fantasy? Wait. I thought that Philip and Mary were the ogres in this fairy tale? That little Lord Bolbec fled them in a sleigh, pursued by wolves? That they were never ever to know where the heir of Oxenford was hidden? And now he’s going to Christmas parties at their castle? Ms. Hughes, do you read what you write? Either Ankerwycke is a secret refuge from the wicked King and Queen, or it’s special, being close to their fairyland—oh sorry, court. It can’t be both. Do carry on. Studious? There’s no evidence whatever that the earl applied himself to learning, then or later. At best, he was dilettantish, a trifler in the arts. Solitude? At Hill Hall, that “centre for culture and learning”? Perhaps it seemed quiet after Hedingham, that “oversized, and disorderly household” (J. Hughes). De Vere would always have a taste for riot. Parsimonious? Smith, who spent a fortune on Renaissance splendour? … the glittering lights of thousands of candles, the sweetness of perfumes, candies, and freshly cut herbs, the richly colored clothing of the dancers and musicians, the shouts of excitement at the antics of clowns and acrobats ... must have been thrilling and a little overwhelming. The “Yorick” who bore him “on his back a thousand times” would have been either the witty, gifted John Heywood ... or the legendary Will Sommers. .... One of these might easily have “poured a flagon of Rhenish” on some drunken bystander’s head, to the shrieking delight of an audience of children. And that’s the point of the point of the pyramid, isn’t it? To get her darling onto Yorick’s back. Why else hang onto Ankerwycke, if not to give her little Shakespeare Christmases at court? After all, there was countryside enough in Essex; Smith was there, and all his books. But for the childhood she envisions for her courtly playwright, Hughes must have Windsor and its dazzling revels. All fantasy. The bleak and barren Queen held no such revels. What masques and interludes she saw is a matter of record. They were produced with “Marian parsimony”: her guisers made do with old costumes, mended and refurbished. We know exactly what her revels cost her over five years, to the penny: £385.7s.5d (Wiggins, D&TP 22-23). Her last Christmas revels at court, 1557-8, came to £36.4s. That wouldn’t buy a blaze of candles.8 And they wouldn’t be burning at Windsor. From 1485 to 1603—through the entire Tudor period—no king or queen had kept or would keep Christmas9 there, with three exceptions: Henry VIII in 1523, and Elizabeth in 1563 and 1569 (Steitberger, Court; Streitberger, Appendix 1; Wiggins, British Drama, v. 1). Mary’s Christmases went spent at Whitehall or at Greenwich. That’s a long cold row from Ankerwycke. Happily for scholars, Smith kept a Latin diary. Or rather, brief chronicles of key events, year by year: births, marriages, imprisonments, deaths, illnesses, employments, travels, and celestial happenings (the great nova of 1572, an ill-starred conjunction). Surely this is where he would record his scholar’s progress? His arrival and his triumphs? (“Finished the Aeneid. Began Plato.”) But Oxford isn’t in his book, not anywhere. In 1554, Smith notes, he lost both his posts, as provost of Eton and dean of Carlisle, and was pensioned by the Queen. He notes the exact times (days and hours) that he handfasted and wed his second wife. In 1555, he “found himself ... obsessively studying astrology, not sleeping for three months as he struggled to gain mastery of the art.”10 (Grafton, 103) This is clearly not a time he would have taken on the petty schooling of a wayward little boy. In 1556, he recorded a conjunction of planets, and on the same night, a spectacular January storm of thunder and lightning. He suffered with a bad knee in February. The year 1557 was devoted to rebuilding Hill Hall. His father and his elder brother died. He was still rebuilding Hill Hall in 1558. Queen Mary died. There are no notes regarding 1559-1561, when (presumably) he did have Bolbec in his Essex household; they resume in 1562, with his embassy to France.11 Perhaps he found his tenure as viscount-minder uneventful? 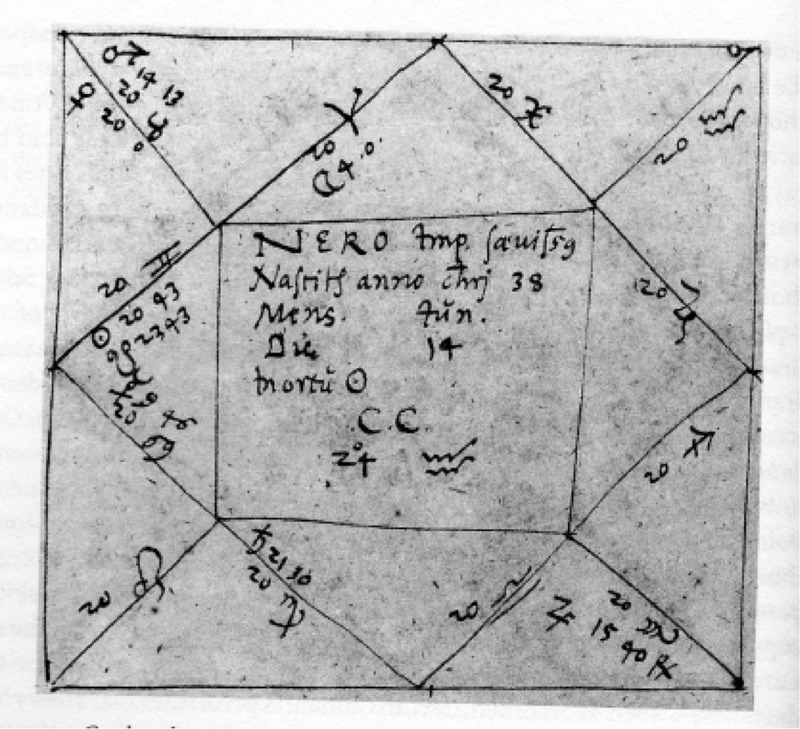 Smith’s obsession with astrology was focused on the reading of genitures. A geniture is a nativity, a sort of horoscope based on the planets reigning at a person’s birth. It looks rather like one of those schoolyard paper fortune tellers. Here’s Nero’s.12 I expect it’s appalling. Those Latin chronicles of Smith’s are his astrological autobiography, a planetary self-analysis. In that same manuscript, he “collected genitures of important people and analyzed them” (Grafton, 112). These crucial people are: himself, twice (he gives his date of birth as 1513 or 1514); “Tailerus,” unidentified, but his customary Latin name for his master John Taylor (the date is transcribed as 1560, but this could be an error for 1500); his first and second wives; his natural son (with “deeply depressing results”); his nieces and nephew; Sir John Cheke, his friend and colleague; Martin Luther; an unidentified William Ferrers13; and one Antonius Grene, born 30 November 1555 and died 16 January 1556, on the night of the great planetary row and thunderstorm at Egham. Egham, I will grant you, is a village near Runnymede, just across the river from Ankerwycke. (What is it with Ankerwycke and foul weather?) It does appear that Smith observed that storm—or had it described to him by a witness—so was likely to have been staying at his old house, at least briefly, that month. Why? Not to haul his agues down the river to Greenwich, to watch Mary’s court (no friends to him) frivoling. There’s no sign of Oxford in Smith’s starry reckonings. This doesn’t mean that the boy was not with Smith (a negative cannot be proved with another negative); it simply extends the blanket of silence that covered de Vere almost from his birth. A fantasy cannot be proved with another fantasy. I could counter that mere paper was unworthy of his lordship, that Smith had Oxford’s nativity graven on a tablet of gold and adamant, which he wore always in secret, and was buried with—and that would be as true as anything Hughes thinks. At a time when people believed that having a man’s horoscope could give his enemies the kind of intimate information that could cause him grief, to record such sensitive information about someone so close to the Crown as the heir to the Oxford earldom would have been seen as, not just bad manners, but tantamount to treason. This, of course, is bravado. Princes sought astrologers for political counsel. Girolamo Cardano—whose work Smith passionately studied14—conversed at length with Edward VI before drawing up his geniture, foretelling a great reign. “He provided a copy of it—presumably in a legible, and even luxurious, manuscript form—for the king’s household to keep” (Grafton, 117). His trouble was timing. By 1554, when his book with this dazzling prophesy appeared, the boy king had died. If a king could commission a horoscope for himself, why on earth could not a viscount have one done? “Tantamount to treason”? Nonsense. Earls are expendable. “So close to the Crown”? Not even remotely. These genitures were done in Mary’s reign, mostly in 1555, when (for all Smith knew) she might have lived to bear a son. Oxford himself never claimed the succession, either for himself or his alleged son, Southampton. As Elizabeth lay dying, the earl did make a pathetically feeble and futile stab at a coup d’état— though his cause was Plantagenet not Tudor. His candidate was Lord Hastings, who did indeed have royal blood, being descended from the Duke of Clarence, that hapless brother of two kings: his daughter’s son’s daughter’s great-grandson, but closer to the throne than Oxford. Had the Viscount been a wonder, a prodigy, an infant Shakespeare—or even a star-crossed unfortunate like that poor Egham boy—Smith might well have cast his horoscope, divined his fortunes. It seems “this star of England” wasn’t dazzling—not to Smith, who knew him well. I’m afraid the inverted pyramid has toppled on its point, and is subsiding, slumped into the mud of Ankerwycke. As for “Smith as Oxford’s surrogate father, the Aristotle to his Alexander, the Plato to his Aristotle, the Leopold Mozart to his Amadeus”—Codswallop! It was Gabriel Harvey who revered and emulated Smith; Harvey who debated with him as an equal and read Livy with his son (Jardine, 40-42); Harvey, to whom Smith’s widow gave “certaine rare manuscript books.” Like Smith, his kinsman “was simply too clever for his own good, and his abrasive manner, ‘high in th'instep’ (BL, Harley MS 6989, fol. 141), left him isolated” (Archer). For all his quirks and eccentricities, it was the ropemaker’s son who was Smith’s true intellectual heir. In the seventh of his Latin elegies for his late teacher, Harvey named Smith’s disciples: Cheke, John Redman, “great Burleigh,” the elder Cox, and Walter Haddon.15 Strype echoes and extends: “And the Learnedest and Gravest Men, and his Seniors, and the choicest Wits of the University, would be present when he read, and sit there as his Scholars: As, Redman, Cox, Cheke, Cecil, (he that afterwards was Lord Treasurer) Haddon, Ascham … &c. Men of great Name afterwards in Church and State.” (Strype, 18-9). In this august company, his lightweight lordship is a joke. The great humanist may have been fond of his old pupil. He could not have been proud. His first and last tutor after leaving Smith's household, Lawrence Nowell, resigned within months, writing that his work was not needed.16 A nicely judged ambiguity: it could be (and has been) read as praise, but more reasonably as an appraisal. The earl had simply gone as far as he could go or needed to go. Cecil then wrote Smith for his advice. Did he say that Smith’s young Aristotle had outstripped all praise? Good heavens, no. Bracketing the young Earls of Oxford and Rutland, he asked if Smith could recommend a respectable Frenchman to converse with the boys, and an Italian riding-master. Gentlemanly accomplishments. At 13 and 14, they’re in the same class, and no one called Rutland a genius. Cecil did say that Oxford at thirteen “had learned to understand French very well”—but that's hardly an ecstasy of admiration (Strype, 26). Even in English, he’s no more than seven-eighths literate. We have 77 letters and notes in his own hand, written over 40 years. They display no remarkable intelligence—he might, on a good day, be described as brightish—and a deadly rhetorical ineptitude. He has no ear for language, no feeling for the shape of sentences, the sound of words. His prose is chewed bootlace, his poetry, Procrustean, the sense and syntax wrenched to fit his fusty metrics (”he that beats the bush, the bird not gets”). His figurative language is scant and hackneyed. And worst of all for an aspiring playwright, he’s dull, duller than a great thaw at Ankerwycke. In all the plod and dribble of his writings, there is barely an insight: only grievances. Yet Smith, at Cambridge, “was noted to be one of the Three there, that were the great Masters of the English Tongue” (Strype, 27). For Richard Carew, he ranked higher still: “will you have Platoes veine? reade Sir Thomas Smith”17 (Carew). As for Hughes’s fantasy of “Oxford’s childhood near the bird-filled water meadow ... [and] the garden”—he displays not a whit of interest in the natural world. The country-bred Shakespeare knew his flora; the earl uses bare generic nouns: “fruite,” “flowers,” “weedes,” “bushe,” “tree.” Anything more specific is hackneyed: “Croune of Bayes” or “the Lillie” compared with the “Damaske Rose.” If he knew the names or qualities of any plants at all—if he’d ever seen, touched, scented a violet or a vetch—you won’t find it in his writing. Sir Thomas, charged with the task of making a humanist scholar out of such tawdry silken stuff, might well have sighed for a good honest sow’s ear. It’s worth quoting Grafton’s account of the younger Smith’s nativity at length, as it illuminates Smith’s pedagogic style. A fool by heavenly compulsion! Note that even for this vital mission—the moral salvation of his only son—Smith assigned the actual tutoring to Harvey. It is likely that Smith oversaw the viscount’s education on this model, directing what lessons Fowle would teach the boy, perhaps catechizing his pupil, but leaving the groundwork to the tutor, who continued to be paid. ... so that scholarly discipline could implant the backbone that his inborn character lacked. The boy was thus equipped to play his role in breaking resistance to English rule in Ireland—at least until his own servants murdered him (Grafton, 191-2; Hadfield, Spenser, 66). —and boiled and fed his carcass to their dogs. There’s a play in that. Consider this above all: for Smith, the whole purpose of education—its teleological end—was virtue. I am sory to here of this vndewtifull & vnkyend dealyng of my Lord of Oxford toward your Lordship which I am suer must very mych greave your honor Seyng [=seeing] it greaveth me for the love I beare hym, bicause he was brought vp in my howse. “Bicause he was brought vp in my howse.” That’s where it hurts: that Smith has failed in his great charge, that his upbringing in virtue—his scholarly discipline—had not made a virtuous man of the boy. It is almost an admission: “This thing of darkness I acknowledge mine.” Not quite. Smith finds it easier to blame “cownsellores & persuaders.” There’s a play in that. —Anon ,“Hill Hall, Essex, the residence of the Duc de Moro” in Country Life, 7 July, 1906, 18-27. —Blackstone, Mary A, “Theatrical patronage and the urban community during the reign of Mary,” in Shakespeare and Theatrical Patronage in Early Modern England, ed. Paul Whitfield White & Suzanne R. Westfall (Cambridge: Cambridge University Press, 2002). —Burrow, Colin, “Reading Tudor Writing Politically: The Case of ‘2 Henry IV’”, in Tudor Literature, ed. by Andrew Hiscock (= Yearbook of English Studies, 38.1 (2008)), 234–50. —Carew, Richard, “The Excellencie of the English Tongue” (ca. 1595), online ed., http://spenserians.cath.vt.edu/TextRecord.php?action=GET&textsid=32813. —Cole, Mary Hill, The Portable Queen: Elizabeth I and the Politics of Ceremony (Boston : University of Massachusetts Press, 2011). —Dewar, Mary, Sir Thomas Smith: A Tudor Intellectual in Office (London: University of London, Athlone Press, 1964). —Drury, Paul, Hill Hall: A Singular House Devised by a Tudor Intellectual (London: Society of Antiquaries of London, 2009). —Foxe, John, The Unabridged Acts and Monuments Online or TAMO (1570 edition) (HRI Online Publications, Sheffield, 2011). Available from: http//www.johnfoxe.org [Accessed: 01.31.17]. —Grafton, Anthony, Cardano’s Cosmos: The Worlds and Works of a Renaissance Astrologer (Cambridge, MA : Harvard University Press, 1999). —Graves, R. B., Lighting the Shakespearean Stage, 1567-1642 (Carbondale: Southern Illinois University Press, 1999). —Hadfield, Andrew, Edmund Spenser: A Life (Oxford: Oxford University Press, 2012). —Hadfield, Andrew, “The Impact of Sir Thomas Smith,” in Early Modern Exchanges: Dialogues Between Nations and Cultures, 1550-1750, ed. Helen Hackett (London: Routledge, 2016). —Harvey, Gabriel, The works of Gabriel Harvey, Alexander Balloch Grosart, ed., (London: Printed for private circulation only, 1884). —Jardine, Lisa and Anthony Grafton, “‘Studied for Action’: How Gabriel Harvey Read His Livy,” in Past & Present, no. 129 (Nov., 1990), 30-78. —Lipscomb, George, The History and Antiquities of the County of Buckingham, v. 4 (London: J. & W. Robins, 1847). —Nelson, Alan H., Monstrous Adversary: The Life of Edward de Vere, 17th Earl of Oxford (Liverpool, England: Liverpool University Press, 2003). —Nichols, J.G., “Some additions to the biography of Sir Thomas Smith,” Archaeologia, 38, 1860, 98-127, online ed., http://hdl.handle.net/2027/njp.32101076451432?urlappend=%3Bseq=134. —Nichols, John, John Nichols's The Progresses and Public Processions of Queen Elizabeth, ed. Elizabeth Goldring et al. (Oxford: Oxford University Press, 2012). —Smith, Thomas, Sir, Literary and linguistic works (1542, 1549, 1568), pt. 1. Certaigne psalmes or songues of David, translated into Englishe meter, ed. Bror Danielsson (Stockholm: Almqvist & Wiksell, ). —Stoppard, Tom. Arcadia,(London: Faber & Faber, 1993). —Streitberger, W. R. Court Revels, 1485-1559 (Toronto : University of Toronto Press, 1994). —Strype, John, The Life of the Learned Sir Thomas Smith (London: Printed for A. Roper, 1698), online ed., http://quod.lib.umich.edu/e/eebo/A61860.0001.001?rgn=main;view=fulltext. —Wiggins, Martin, British Drama 1533-1642: A Catalogue. Volume I: 1533-1566 (Oxford: Oxford University Press, 2012). —Wiggins, Martin, Drama and the Transfer of Power in Renaissance England (Oxford: Oxford University Press, 2012). With a little help from out friends. Copyright in all images from Smith's notebooks is asserted by Queens' College, Cambridge, and to Scriptorium: Medieval and Early Modern Manuscripts Online. You may not use these images for any commercial purposes. No Derivative Works. You may not copy, alter, transform, or build upon these images.